Niall Quinn revealed that the player’s age dissuaded the London club from making the move. 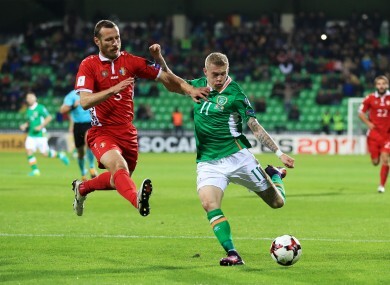 Moldova's Victor Golovatenco (left) and Republic of Ireland's James McClean compete for the ball. NIALL QUINN HAS revealed how Chelsea passed up the chance to sign James McClean during his Derry City days despite initial interest in the player. West Brom star McClean has been earning plaudits for his brace in Ireland’s win over Moldova during the week. And in a new column for Sky Sports, Quinn has recalled the time when the young player first came on his radar while he was working at Sunderland. Quinn says Sunderland scout and former player Bryan ‘Pop’ Robson recommended McClean to the Black Cats during his first day on the job, adding that Chelsea were initially interested but passed up the chance to buy the Irish winger because of his age (22) and the structure at the club. He also revealed how, as part of the deal to join Sunderland, McClean’s agent persuaded Quinn to contact the FAI and enable the player to switch allegiance from Northern Ireland, who he represented at underage level, to the Republic. In addition, Quinn recalled how then-Sunderland boss Martin O’Neill kept McClean grounded in those early days. “When I look at him playing now I still view him in those terms. Will he keep it on the rails? For instance, most young players who make the first team gradually work their way up to having a more respectable car in the players’ car park. James hadn’t been long in the first team when I was gazing out the window of my office one day to see a massive, gleaming Range Rover-type thing pulling in and young James hopping out on the driver’s side. Uh-oh? Email “Chelsea turned down the chance to sign a young James McClean”. Feedback on “Chelsea turned down the chance to sign a young James McClean”.